Three books of travel writing covering the USA, Canada, Japan and Egypt. 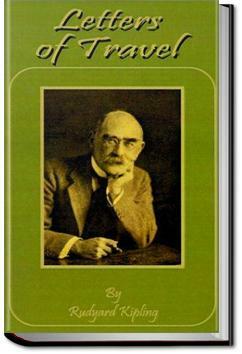 Rudyard Kipling (an Englishman born and raised in India) offers an interesting outsider's view of the places he visits, candid and sharp witted, yet with a deep humanity.
. . . payable in cash on a three, or as some say a five, yearly settlement. But, according to certain officials, there has been no settlement since 1875. Land lying fallow for a season pays the same tax as land in cultivation, unless it is unproductive through flood or calamity (read earthquake here). The Government tax is calculated on the capital value of the land, taking a measure of about 11,000 square feet or a quarter of an acre as the unit. Now, one of the ways of getting at the capital value of the land is to see what the railways have paid for it. The very best rice land, taking the Japanese dollar at three shillings, is about £65:10s per acre. Unirrigated land for vegetable growing is something over £9:12s., and forest £2:11s. As these are railway rates, they may be fairly held to cover large areas. In private sales the prices may reasonably be higher.